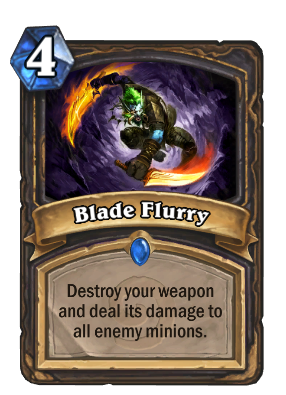 It was announced on April 20th, 2016 that Blade Flurry would receive a nerf. Mana cost increase to 4, up from 2. Now only deals damage to enemy minions - does not include the Hero. As long as it can only kill minions, I'm pretty okay with a mana cost update to this card. I know it's probably an unpopular opinion, but I really miss the old version of this card. I wish it existed at the same time as Kingsbane, at least for a while, even if it ended up needing to get nerfed. In my mind, Oil Rogue is representative of the class' identity maybe even more than Miracle is. This card has bailed me out of many tempo losses. Does not Lifesteal with a Lifesteal weapon, keep that in mind. Seeing Kingsbane now makes me shudder to think that this used to be a 2 mana that can hit face. I think they just need to lower the cost to 3 or 2 and remove the destroy weapon part. I mean the only viable way to use this now is to build a up a decent weapon, and you now have cards to extend your durability. It juts doesn't make sense to destroy your weapon, it not like you could oil it. IF it works with the card just announced, Vampiric Poison... then I can see why. Imagine if it did! Rogues, with a negligible AoE AND healing at the affordable price of at least 8 mana as well as a weapon? preposterous! Still hoping it works differently. Man, I hated this card and I hated Oil Rogue... but this is just so typical of Blizzard balancing to completely ruin the card. It needed one of the two nerfs it got, not both. Removing face damage was enough to prevent some of the wombo combos, plus the main enabler Oil, isn't even in standard anymore, so the board clear effect isn't even that amazing for 2 mana (plus another 1 and a card for deadly poison or something). Remember this card before nerf? I remember. No aoe or heal for rogue. Lame. Guaranteed board clear if you make your weapon Poisonous. Goodbye, massive Jade Golem boards! It was confirmed afterwards that the interaction doesn't work that way, because Rogue can't have a large board clear. My comment was shortly after Envenom Weapon was revealed.